Fluke Three-Phase Power Quality Loggers give you fast, easy access to the data you need to make critical power quality and energy decisions in real-time. Compact and rugged, the Fluke 1740 Series Three-Phase Power Quality Loggers are designed specifically for technicians and engineers who need the flexibility to troubleshoot, quantify energy usage and analyse power distribution systems and fully compliant with international power quality standards such as IEC 61000-4-30 and capable of simultaneously logging up to 500 parameters while also capturing events, the Fluke 1740 Series helps uncover intermittent and hard-to-find power quality issues more easily than ever. The “Energy Analyse” plus software quickly assesses the quality of power at the service entrance, substation, or at the load, according to national and international standards like EN 50160 and IEEE 519. The only analysis tool you need to easily track down all your power and related problems. The Fluke 1740 series includes three rugged and portable monitor products, designed for easy installation and use. Fluke 1742: The base power logger providing measurement of voltage and current, inter-harmonics, mains signalling, unbalance, and frequency. 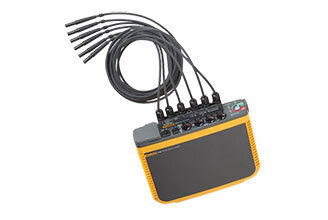 Fluke 1746: An advanced power quality logger including the measurement capability of the 1742, plus additional monitoring such as mains signalling, unbalance, and frequency. Fluke 1748: The ultimate power logger offering all of the functionality of the Fluke 1742 and 1746, plus transient event logging and Waveform and RMS profiles recording .